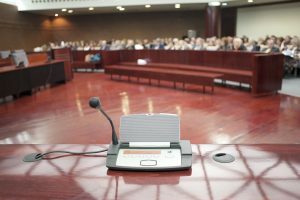 This month, the Judicial Panel on Multidistrict Litigation (JPML) will hear arguments regarding whether to consolidate the numerous pending cases against Ethicon, a subsidiary of Johnson & Johnson, regarding its physiomesh products. The JPML is the body responsible for overseeing multi-district litigation (MDL), which is a legal process that is somewhat similar to class actions. When dangerous products harm numerous victims, the cases often involve similar factual allegations and legal claims. To streamline the process and promote efficiency, the cases can be organized in an MDL proceeding before one judge. Unlike a class action, each plaintiff maintains his or her individual case and must prove that he or she is entitled to damages. Physiomesh is a product targeted toward hernia repair surgeries. It is a synthetic mesh material that is marketed to be used in laparoscopic herniorrhaphy procedures. The product’s unique design features five separate layers. Two types of material make up the first four layers, while the final layer is polypropylene mesh. This design has not been used in other mesh products. According to Ethicon, the multi-layer feature is designed to reduce adhesions and inflammation and to help fixate and incorporate the mesh into the abdominal area. The concern regarding Ethicon’s physiomesh arose in May 2016 when the company issued a recall after discovering that the product leads to higher revision rates when used in a specific type of hernia repair. Revision surgeries can be extremely painful and expensive for patients, especially when they anticipated having their medical issue resolved during the first procedure. According to the plaintiffs’ complaints, the mesh product is defective because the multiple layers prevent it from adequately incorporating into the abdomen, resulting in a variety of serious injuries and complications. Some complaints also allege that the mesh was unable to withstand normal pressure and impact on the abdomen, resulting in herniations, recurrent hernia formations, or ruptures and deformations of the mesh. A number of plaintiffs also required a revision surgery to correct these conditions and injuries. As a result of these allegations, the plaintiffs allege that Ethicon’s physiomesh is unreasonably dangerous and that the company failed to provide adequate warnings regarding the risks associated with the product. Currently, there are at least 18 lawsuits pending against Ethicon in nine federal courts throughout the United States. According to some reports, over 330,000 units of the physiomesh device have been sold around the world. According to some of the plaintiffs’ complaints, at least half of these products were distributed in the U.S. This could mean that thousands of additional lawsuits will be filed in the near future, argue the plaintiffs. At Moll Law Group, our experienced transvaginal mesh lawyers have represented victims of mesh-related lawsuits across the United States, including in Illinois, Florida, New York, and Texas. We understand exactly what you and your family are going through during this difficult time, which means we know how important it is that you receive the reliable, tenacious, and personalized legal counsel that you deserve. We offer a free consultation to help you learn about your legal rights and how we may be able to assist you with seeking compensation. Call us now at 312-462-1700 or contact us online.